...but that was so long ago that it's hardly worth mentioning. The accordion was practically a new instrument back then, the saxophone was considered a novelty item (some would still say it is...), and drum heads were still made from actual animal skins that drummers had to hunt for on their own! The Internationals™ have been playing together more than 30 years, and remain one of the most popular bands in the SF Bay Area. But from the beginning, Bobby has been the core of the band -- starting his playing career while still in high school. Stevie, on the other hand, came along during Bobby's college years. By comparison, Jan is practically a newcomer. And then there's the true "newbie" in the group, Tom. So what follows is a (very) brief account of how this band got to where it is today. Bobby Maggiora returned from college and almost immediately began to miss his performing days in high school. So of course, he almost immediately put together another band! 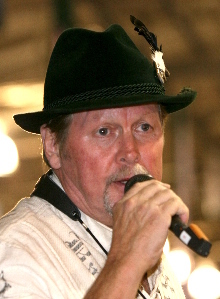 As the band started playing more often, Stevie found himself driving from his home in the central valley on a regular basis to play gigs with the group. And what do you know... Stevie can sing! 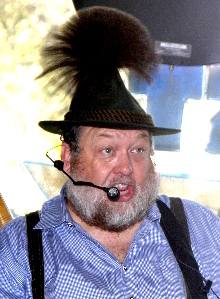 He quickly became the lead vocalist on many of the band's numbers. So it wasn't long before Stevie was a permanent part of the newly named band, The Internationals™. From the beginning, the focus was on playing a variety of music genres and styles (hence the name!). 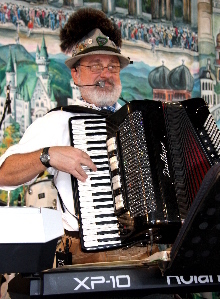 Naturally, they played all the European dance favorites -- polkas, waltzes, schottiches, etc. -- and also mixed in traditional favorites from a variety of European countries. In addition, they played a smattering of American jazz, blues, country and even rock-n-roll classics. It wasn't uncommon to hear a polka followed by a country western classic! Over the years, The Internationals™ have historically played primarily as a quartet. Early on, it was two accordions, bass and drums. Later, it was accordion, trumpet, bass and drums. And then for a spell, it was just a trio... you guessed it: accordion, bass and drums. The trio configuration actually lasted for a number of years. But after a while, the boys decided it was time to bring a horn player back into the group. 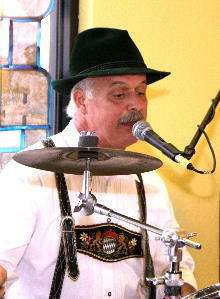 Jan had been playing for many years in his father's band. But as time went on, he started to venture out to other bands now and then. As it turns out, the experience of playing with a number of different bands helped him to develop into quite the versatile musician. His travels eventually included an occasional evening with The Internationals™, and it wasn't hard to figure out that this combination sounded pretty good! And not only did this four-piece combo sound good, but the addition of Jan expanded the band's horizons, so to speak. With his ability to speak (and sing) in three languages, and play (at least) 8 different instruments, the band found itself capable of tackling music that would have been much more difficult with only three members. So the band was back to a quartet, and sounding better than ever. Fast forward to 2012... and the introduction of the band's new percussionist, Tom Cassaza! Tom has been a long-time friend of the band, even sitting in from time to time. As of January, 2012, Tom became the full-time drummer for the group and -- once again -- we see a repertoire expansion for The Internationals™. This is because Tom brings not only his skills on the trap set to the band, but also his considerable skills as a vocalist.